In 2001 Vince McMahon bought his competition, WCW. But in the process, we found out his son Shane had actually made the deal and he and sister Stephanie waged war with WCW and ECW stars against WWF's top Superstars. Several WWF guys jumped ship, including "Stone Cold" Steve Austin and Kurt Angle. But at Survivor Series that year it was Team WWF that led the way to take on WCW's team, which really had a poor representation of that company, but I digress. The winning team of this event would go on to control the fate of the company. 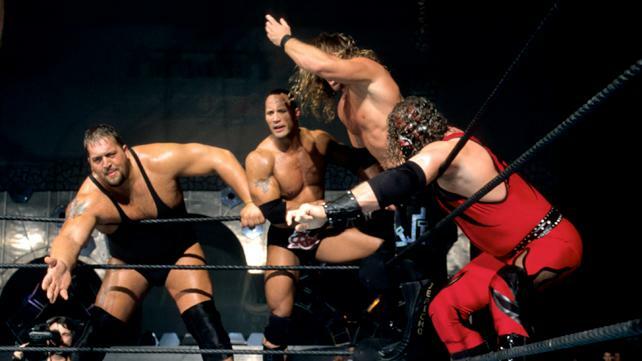 Team WWF was one of the strongest Survivor Series teams created in the history of the event. The Rock, The Big, The Undertaker, Kane and Chris Jericho would all go on to win multiple championships in the company. The Rock ended up being the sole survivor in this match and really shined. He was still WCW World Champion during the match, but the next night the title became just the World Heavyweight Champion and eventually would merge with the WWF Championship. Months later Jericho would be the first Undisputed Champion. Vince became a heel again after this match. Austin returned to being a face. And the "Nature Boy" Ric Flair made his WWF return after a nearly 10-year absence from the company. That's just some of the aftermath from this match. My armchair booking point on the Invasion angle (at least one point) is when Austin turned against the WWF, I would have liked to see him become "Stunning" Steve Austin again since he was representing WCW. Paul Heyman was a part of the Alliance so it could have worked (in my 1-2-3 cents).